Today was Day #7 of Chocolate and Coffee Theme Week. I found this colorfully upbeat five-pack of candies from Meiji in my chocolate vault. Unfortunately, most of the origin information was lost to the sands of time. The Asian characters on the plastic wrapper offered me no clues. The fun was in discovering what the five tiny boxes revealed. Each box in this miniature candy library contained a small trove of colored candies when opened. Small cartoon characters adorned each box. 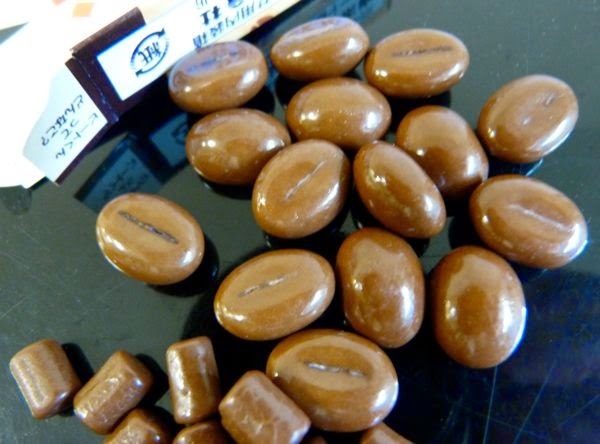 The Coffee Beat chocolate candies -- that looked very much like coffee beans, with a slightly crunchy thin outer shell -- were made of sweet chocolate with a very faint hint of coffee flavor. A blue cartoon mouse with a hat on the packaging smiled as it appeared to do a caffeinated jig. 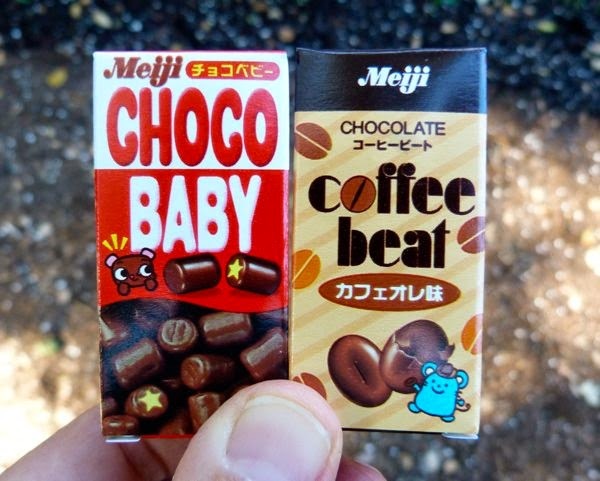 The Choco Baby chocolate pieces were chocolatey, and the shortened cylindrical shapes that reminded me of jujube candies. 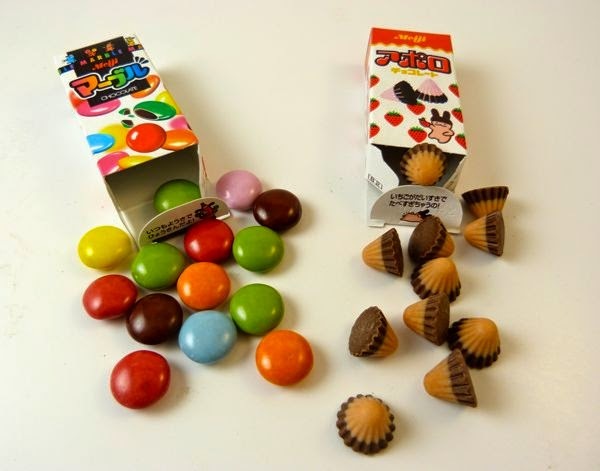 Another box was filled with small, candy coated chocolate discs (think M and Ms or Smarties). The floral-colored candy coated shells were very pretty. Yet another box was filled with tiny, pale strawberry pink cones topped with a chocolate layer on top. A pink rabbit character with dark brown chocolate ears gazed out at us from the box and offered to be our guide in this tasting experience. All these chocolates were remarkably fresh and colorful, considering they were a few years old.